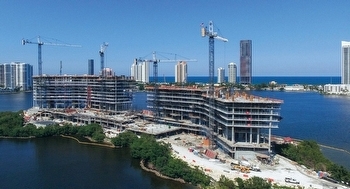 Prive Aventura Condominium construction progress shown above as of Mid-June 2016. 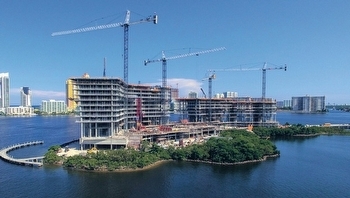 Prive at Island Estates in Aventura officially broke ground in June 2015 and expected completion is planned for mid 2017. Shown above is a photo taken at end of mid-June 2016 and a rendering of the completed Prive condominium property. The Privé at Island Estates condominium in Aventura is a secluded enclave of only 160 luxury condominium residences and expansive penthouse homes in twin, 16-story waterfront towers on it's own private island. 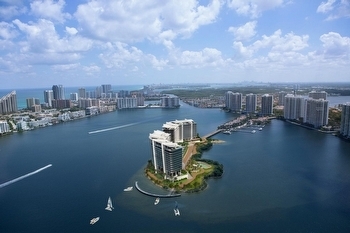 Accessible only via the gated Williams Island community or by water. The Prive condominium pricings are still available starting at approximately $2m*. 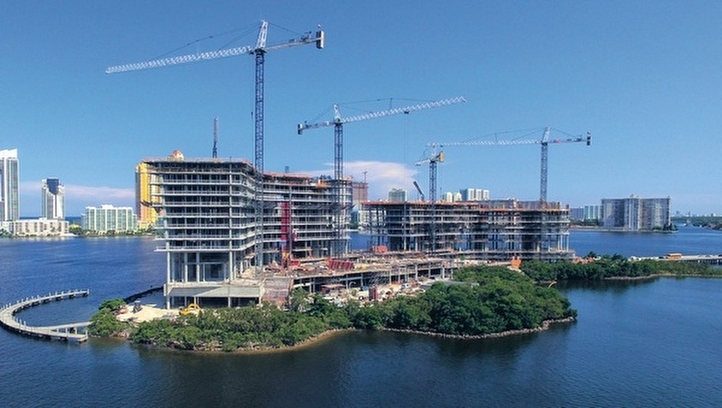 The island waterfront and bayfront luxury residences will range in size from 2,585 to over 5,600 square feet of indoor space, with each luxury residence featuring 2 expansive terraces, each with beautiful bayfront water views. The eastern side ocean view terraces all include a summer kitchen for added outdoor enjoyment. All Prive at Island Estates Aventura residences feature private elevator entries, east-to-west flow-through floor plans with 10-foot high glass from floor-to-ceiling, expansive east/west water and bay views, European kitchens and bathrooms, outdoor summer kitchens on the eastern side bayfront terrace and more. Prive at Island Estates Aventura condominium floor plans feature 2, 3 and 4 bedroom plans with select top floor penthouse homes offering larger plans. All of the Prive at Island Estates Condominium top floor penthouse homes will feature their own private rooftop deck with pool. When completed the Prive Condos at Island Estates at Williams Island Aventura will feature approximately 70,000 square feet of indoor amenities - more than any other condominium development in South Florida. Prive at Island Estates in Aventura, Miami Florida is utilizing the large 8-acre private island setting to also offer expansive outdoor amenities whitch will include: 2 pools, Jacuzzis, 2 state-of-the-art gyms and spas, tenns court, playground, jogging path, marina, fishing pier, and lushly landscaped grounds with private beach areas. All of these exceptional features and amenities recently led to Prive being voted the most desirable condominium development in South Florida and the 14th most desireable worldwide by Elite Traveler. View all details, artist renderings, floor plans and more on my websites Prive Aventura page at - Prive' at Island Estates Aventura Condominium web page. 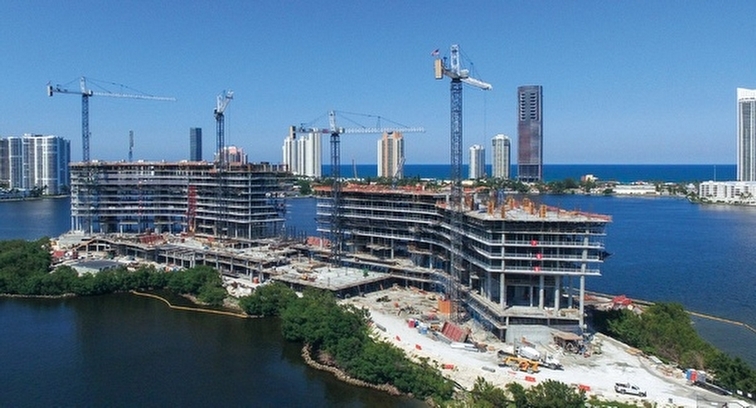 Prive Aventura Condominium construction progress shown above as of March 23rd 2016. 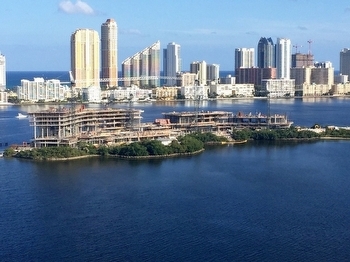 Prive at Island Estates in Aventura officially broke ground in June 2015 and expected completion is planned for mid 2017. Shown above is a photo taken at end of March 2016 and a rendering of the completed Prive condominium property.